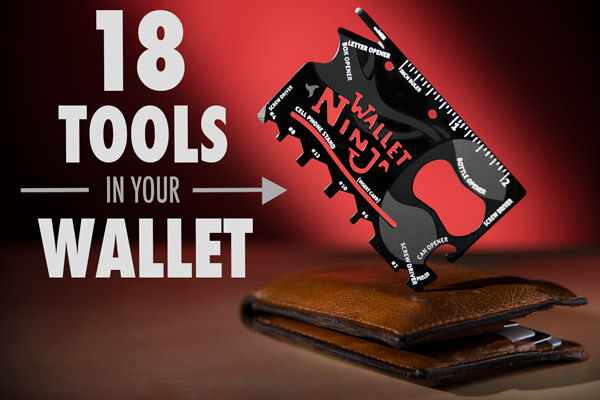 Outfit any wallet with 18 useful, everyday tools with the Wallet Ninja. The TSA-approved Wallet Ninja boasts a lifetime guarantee to never rust, bend, or dull. Made from 4X heat-treated steel, Wallet Ninja is thinner than two credit cards and will fit into any wallet. 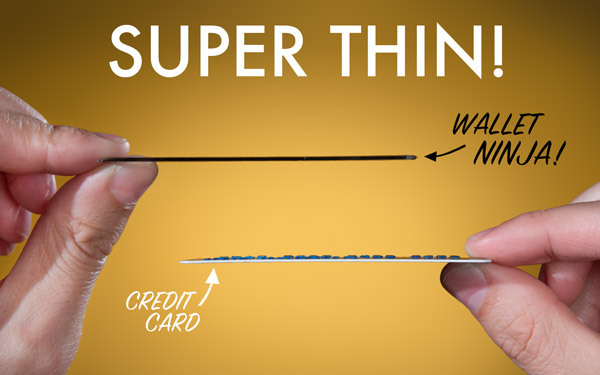 The Wallet Ninja sports eighteen useful, everyday tools that fit into a metal rectangle the size of a credit card. Keep this multi-tool in your wallet and you'll always be prepared to slice open that cardboard box from alphabargain full of curiously awesome products! 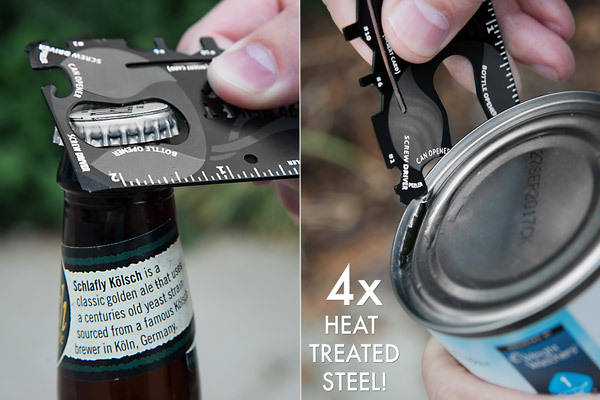 The Wallet Ninja is made from 4X heat-treated steel. So despite being only 1.5mm thick, it's incredibly strong. You can't bend this sucker — it's as solid as steel (because it's solid steel). The manufacturer backs the Wallet Ninja with a lifetime guarantee. 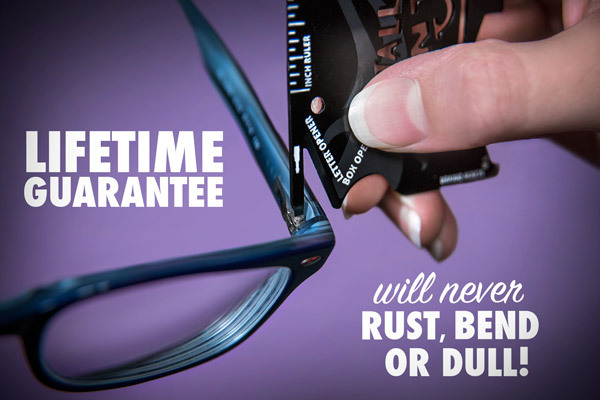 It will never rust, bend, or dull! 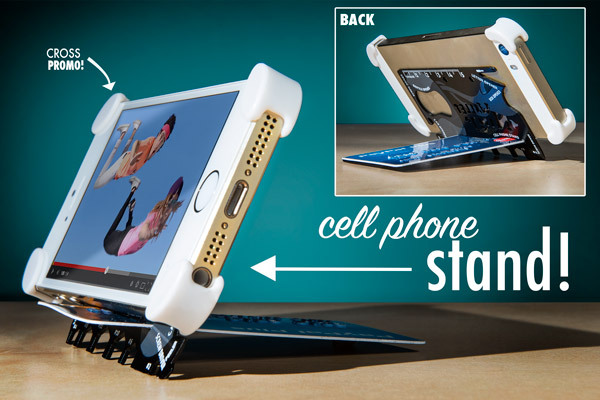 Our two personal favorites on the Wallet Ninja are the box opener (to get at all the goodies we buy online) and the cellphone stand. The absence of sharp edges and its small size has earned the Wallet Ninja the distinction of being TSA-approved. You are hereby cleared to carry the Wallet Ninja aboard your next flight. Open stuff in a pinch! In addition to six hex wrenches and four screwdrivers, the Wallet Ninja is packed with eight other everyday tools. These include a bottle opener, can opener, letter opener, box cutter, inch and centimeter rulers, the aforementioned cellphone stand, and a fruit peeler! Question: It looks like it has a lot of sharp edges. Will it cut me? Answer: No. 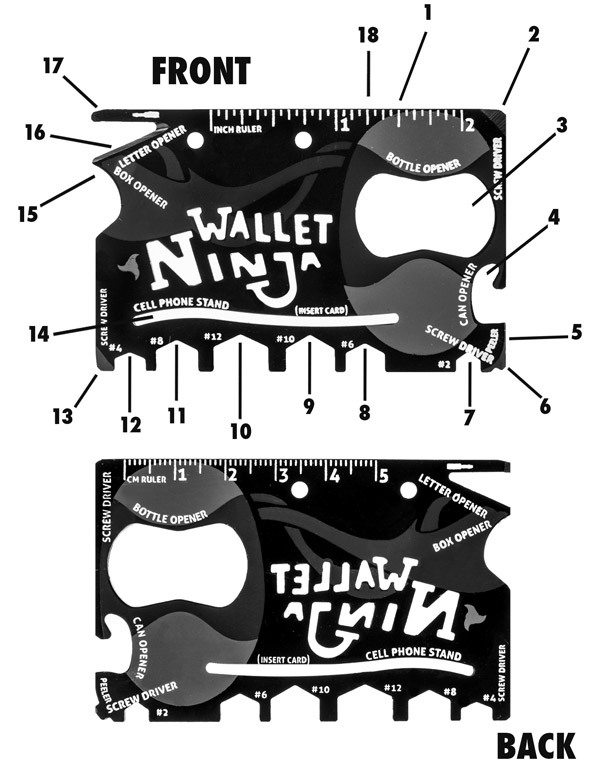 The Wallet Ninja is designed to cut boxes and letters but not your hand. Question: Can I take it on the plane? Answer: Yes, it's TSA approved! Question: I put my wallet in my back pocket. Is it going to bend? Answer: Nope! 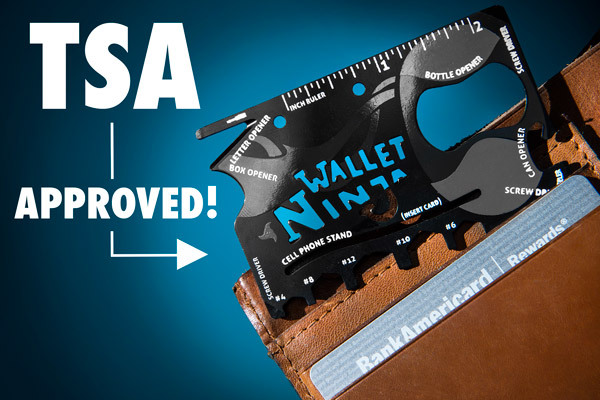 The Wallet Ninja is made from 1.5mm of steel and is guaranteed to never bend, rust, or dull.